DUBAI (Reuters) - Four Gulf states sent condolences on Monday for former Iranian president Ali Akbar Hashemi Rafsanjani, signaling appreciation for a pragmatist who sought regional detente, but there was no immediate word from Riyadh, Tehran's main Gulf Arab adversary. The heads of state of Bahrain, Kuwait, Qatar and the United Arab Emirates (UAE) expressed condolences after the death on Sunday of Rafsanjani, 82, a founder of the Islamic Republic and a powerful pragmatic influence in Iran's factionalized politics. Rafsanjani's funeral will be held in Tehran on Tuesday. Iran has announced three days of mourning, including a public holiday on Tuesday, for Rafsanjani, who was president from 1989 to 1997 and a key figure in the 1979 revolution that overthrew the Shah Mohammad Reza Pahlavi. Rivalry between Iran and Gulf Arab states, especially Saudi Arabia, has helped to fuel a decade of violence and turmoil across the Middle East. In Syria, Iraq, Lebanon and Yemen, the two sides back sectarian proxy forces that tussle for influence or are openly at war. But Rafsanjani routinely called for improved ties with Gulf Arab states, was known to have good relations with senior Saudi officials and was seen as a key figure who could have resolved rising tensions between the regional rivals in coming years. Writing on his official Twitter account, UAE Minister of State for Foreign Affairs Anwar Gargash described Rafsanjani as "one of the voices of political realism and moderation". Bahraini Foreign Minister, Sheikh Khaled bin Ahmed al-Khalifa, whose country has tense relations with Iran, voiced condolences on Twitter over Rafsanjani's death. Riyadh accuses Tehran of fomenting trouble in Bahrain and even Saudi Arabia itself. Tehran accuses Riyadh of plotting its destruction with Washington. 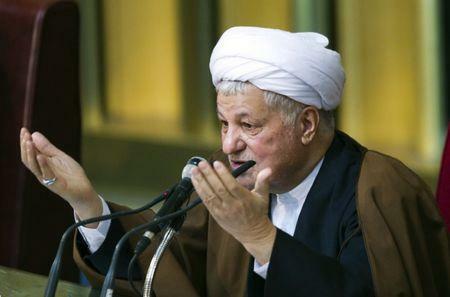 In an interview in Aug 2015, Rafsanjani told Al Monitor website that Iran did not inherently have problems with Saudi Arabia or other Arab countries "because they are Islamic and we see cooperation with them as a priority in our constitution." He was quoted as saying events in Syria, Iraq, Yemen and Bahrain were among a number of issues that had created "a distance", but if Iran and Arab governments decided to work together it would be possible to normalize the situation. "I really believe it is possible. However, we have to see where these events lead, which is very important," he was quoted as saying. Condolence messages also came from pro-Iranian Arab forces include Lebanon's Hezbollah and Yemen's Houthi group.